The focus of the Business Studies course is to develop a foundation of skills and knowledge and understanding required for the 21st century. The course covers a wide range of topics. 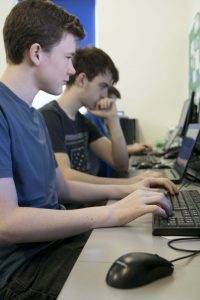 A variety of assessments techniques will be used including written examinations, role plays and coursework assignments. The course follows the specialist pathway of marketing. You will learn by applying your skills, knowledge and understanding to tasks and activities that are relevant in business. Key skill development will be in communication, team work, planning and organisation. Work experience is offered to all Year 12 students so you can apply your skills and knowledge in a contextual setting. Cambridge Technicals are designed to help you prepare to meet the expectations of employers and develop entrepreneurial skills. Level 3 students may progress to study a range of courses at university or enter their chosen career. Options include banking, administration, retail, IT, marketing, human resources, law or management. Assessment: External and Internal assessment. Progression Route: University, apprenticeship or employment in the business sector. For exam board information, please click here. Interested in studying at MCA6? Click here!